There is a relatively new treatment for Lyme disease and the co-infections that is designed to improve how a person feels by regulating the immune system away from inflammation. Some practitioners using this method are reporting improvements in up to 90% of people. It is called LDI which is an abbreviation for Low Dose Immunotherapy. This therapy was designed in February 2015 by Ty Vincent MD from Alaska who is not a Lyme Literate Medical Doctor. He developed it based on his work with Low Dose Allergen Immunotherapy (LDA) a method to treat food, inhalant (pollens and dander), and chemical allergies/sensitivities. Dr. Vincent believes antibiotics are not necessary for Lyme; that regulating an over active immune system is all that is needed. I strongly disagree and think LDI can be used as part of a comprehensive Lyme treatment that involves herbal or prescription antibiotics. Because most Lyme symptoms are caused by an overproduction of inflammatory cytokines by the immune system, it makes sense that decreasing inflammation can help a person feel better. What is not clear yet is if turning down all of this inflammation through LDI keeps the germs under control long-term. On the one hand the cytokines turn the immune system on to fight germs. On the other hand in excess they give Lyme symptoms and can suppress the immune system. So regulating the cytokines with low dose immunotherapy could decrease symptoms and help the immune system work better to keep the germs under control. However, it is possible LDI could suppress the immune system which would allow the germs to overgrow and cause greater problems down the road. At present we have no research to guide us as to which of these situations is true. The recording is from our Lyme Q&A Webinar Conversations with Marty Ross MD 2/10/16 when he practiced in Seattle, Washington. decreasing viral and bacterial replication. decrease the function of various organs throughout the body resulting in many other symptoms and medical problems. Cytokines are made when immune cells are stimulated by germs, oxidizing agents, cytokines, toxins, and other agents. Once the immune cells are stimulated an intracellular messenger called NF-kB causes genetic programming for the production of cytokines and the turning on of white blood cells to fight infections. Within the white blood cell cytokines are then produced in chemical reactions which require enzymes called kinases. Cytokines in Lyme Disease Treatment: What’s the Problem? Cytokines are good, right? Well yes and no. In the right amount they promote healing. In excess, they are harmful. The problem in chronic Lyme and associated diseases is that they are made in excess. There are three different types of immune system inflammation pathways in the body. These are called Th1, Th2, and Th17. Th stands for a type of white blood cell called a T helper cell. T helper cells are in the class of first responders to some type of insult to the body whether it is a germ or something we are allergic too. Th1 cells release cytokines that turn on cells that attack viruses and bacteria like Lyme and the coinfections. Th1 cells regulate cellular immunity. Th2 releases a different pattern of cytokines that regulate humoral immunity. That is the part of our immune system that uses proteins called antibodies to fight infections or things we are allergic too. Th17 cells patrol our mucous membranes like those in the nose and the intestines. To protect the borders this way Th17 cells also release different kinds of cytokines. The parents watching over Th1, Th2, and Th17 are called T Regulator Cells or Tregs for short. Increasing Tregs can decrease Th1, Th2, and Th17 inflammation. LDI in theory increases Treg cells against Lyme and the coinfections. By increasing Tregs, Th1 and Th2 inflammation are turned down decreasing cytokines. LDI is a liquid which has two different parts. One part is an enzyme called beta-glucuronidase. The other part is extremely dilute doses of dead germs. This second part is different depending on the infection being treated. For instance if the problem is the coinfection bartonella, then just bartonella germs are used. If it is Lyme and various coinfections then the second part includes different strains of lyme, bartonella, babesia etc. This is the magic chemical that makes LDI effective. In fact we know from research that beta-glucuronidase does increase Tregs. This we know from the pioneering work of Dr. Leonard McEwen who is the father of enzyme potentiated desensitization which was later developed into LDA in this country by WA Shrader, JR., MD in 2001. Dr. McEwen injected beta-glucuronidase into nose polyps and found they decreased in size. Nose polyps occur as a result of nose allergies. This lead him to investigate using it further and incorporating it into his allergy desensitization shots. Beta glucuronidase increases Tregs for the substances it is mixed with. So it can increase Tregs for tree pollens if that is what it is mixed with. Be aware though that there is no research that has been done to show that Tregs increase when the beta-glucuronidase is mixed with dead germs as part of LDI for lyme and/or the coinfections. However this is how we suspect it works. LDI can be given by injection into the skin or it can be taken under the tongue. The skin and the membranes under the tongue are rich with immune cells. If placing under the tongue is not effective then it might be more effective to try it as shots. Starting dose. Dosing is started extremely low. This occurs by diluting the germs many times. For instance a person with severe Lyme receives an initial dose which is diluted as 1 part of liquid into 100 parts of water. This process is repeated 20 times. This dilution is called a 20C dilution. A person with moderate symptoms could start at 10C to 12C dilution. Frequency. An ideal dosing frequency is every 7-8 weeks once the best dose is found. If a person flares up on the initial dose, then a more dilute dose is given 7 to 8 weeks later. It takes 7 weeks for the existing T cells to die and to be replaced by new T cells. Dose Titration. If the initial dose does not produce any kind of improvement in 10 days then a titration dose can be given of the next strongest strength. For instance if you start at 20C dose and get no improvements at all then the next dose is 19C. Booster Dose. If a person has some improvement that does not last the full 7-8 weeks, then a booster dose can be given. The strength of a booster can range from 1% of the dose strength up to 50% depending on the length of the improvement. When boosters are given the cumulative dose over the 7-8 weeks is added together to determine the next dose at 7 weeks from the initial dose. Beta-Glucuronidase. Beta-glucuronidase is given as .01ml along with .04ml of the germ dilution mixture. Based on my experience when I practiced in Seattle, I generally did not find LDI effective for most with Lyme disease. For some, it made the illness dramatically worse. I acknowledge that some LLMDs have a different experience than what I did. If a person wants to try LD, then consider the following points. LDI should never be used as a replacement for antibiotics in acute Lyme. If antibiotics are started in the first month of when one gets acute Lyme, there is a very good chance it can be wiped out completely from the body. Using LDI without antibiotics in this setting means someone could develop chronic Lyme infection. 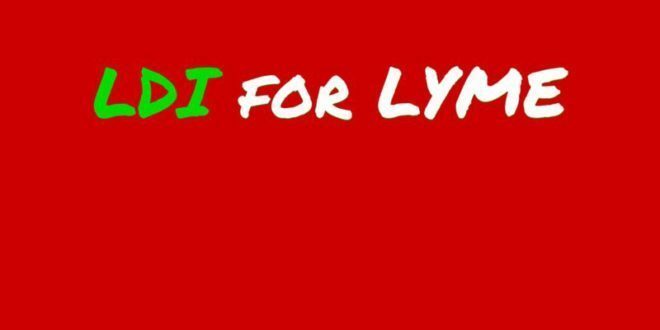 Consider LDI if standard treatment like those I recommend in throughout Treat Lyme are not working by 1 to 2 years. However be sure you are following all parts of my Lyme disease treatment guideline The Ross Lyme Support Protocol. While considering LDI also consider other issues that could be blocking your treatment success like those I mention in Treat Lyme chapter Can’t Get Better? Do This. Use LDI with antibiotics to wipe out the germ. I am concerned as I mention above that LDI may suppress the immune system in a way that allows Lyme and the coinfections to grow which could cause more problems years down the road.